It's only been two months since Acer revealed the Aspire S7 Ultrabook at Computex 2012, and the Taiwanese manufacturer has already revealed pricing and release info for the new device. The Aspire S7's release date has been confirmed as the end of September, and the ultrabook will drop for $1,465 (£1,149.99). That means the initial runs will be equipped with Windows 7, as Windows 8 will release on October 26, three to four weeks after the Aspire S7 launch. The thin S7 should get a Windows 8 reboot after the OS hits the public market. 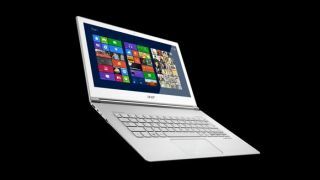 Acer's Aspire S7 Ultrabook by default sports an Intel Core i5 Ivy Bridge processor, 128GB of SSD storage, 4GB RAM, and HDMI, USB and memory card reader ports. A 12-hour battery cycle and backlit keyboard also serve to sweeten the deal. The Aspire A7 comes in 11.6- and 13.3-inch flavors, but the thin machine can be beefed up significantly with a number of upgrades, including more RAM and SSD space and the option for a Core i7 chip. In addition, it turns out the Aspire S7's much-hyped touchscreen could be an optional add-on, though there's no word yet on how much extra it might cost. But an Acer spokesperson has revealed to TechRadar that while details haven't yet been announced, it's believed the touchscreen will come standard, though hardware configurations could differ by region. Acer is going to some lengths to ensure that the Aspire S7 stands out. Its attractive "white glass" coating helps differentiate it from the current reigning king of ultra-thins, Apple's MacBook Air. TechRadar predicted that Acer would reveal the pricing and release date for the Acer Aspire S7 at Berlin's IFA 2012 consumer electronics mega-show at the end of August. But the company may have dropped the news now to ensure it wouldn't be lost in the inevitable rush of news from the convention. The fold-back touchscreen is an addition that will no doubt impress Apple fans, but without Windows 8 the Aspire S7's initial runs may lag as would-be buyers wait for Microsoft's OS upgrade.